Find renter friendly creative solutions for hanging curtains that are the wrong length and tips for saving money on window treatments! I love window treatments!! It’s one of the first things I do after we we unpack boxes from a military move. They are such a beautiful way to give a polished look to rentals and add an extra layer of interest when hung properly. The best length for hanging curtains is right below the windowsill or all of the way to the floor. If you are able to place the curtain rod a few inches below the ceiling, your walls will appear taller and make the room feel larger. It can be difficult to find the perfect length of window panels without spending a fortune. Here are some ideas for inexpensive window treatments without having to hang your average 84″ length curtains at an awkward length. 2. Use 84″ sheer curtains on all of the windows in a room expect for a focal wall. This will save you money for 96″ or longer curtains. In my living room the sliding doors have a second curtain rod with 96″ curtains to bring the eye up. It definitely makes the room feel more grand. My favorite places for 96″ curtains are IKEA, Target, and TJ Max. 3. To cover ugly blinds, cut out a rectangle piece of fabric, sew a pocket for the curtain rod, and embellish with ribbon. Even easier, use a tension rod in the window frame to hang your valence. 4. Buy discounted fabric and sew curtains for a custom length. If you don’t have a sewing machine or are not comfortable sewing, use iron-on fusible webbing for hems. My favorite places for shopping for inexpensive fabric are local resale shops and fabric.com. Other alternatives are shower curtains, table cloths, drop cloths, and inexpensive plain curtains with embellishments. Decorating rules you should break! 5. Add a strip of fabric to the bottom of inexpensive curtains for added length. In my daughter’s room I used cheap 84″ panels from Walmart and added a color block on the bottom with hot pink linen fabric (one yard from fabric.com). Renter friendly tip: Hang curtains without putting holes in the wall! Find more decorating tips for renters and sign up for my FREE 5 day email decorating course! « How to deal with a blogging slump! Thank you! Can’t wait to do more this summer! This is truly amazing to see. You’re definitely talented with window treatments and have great tips. 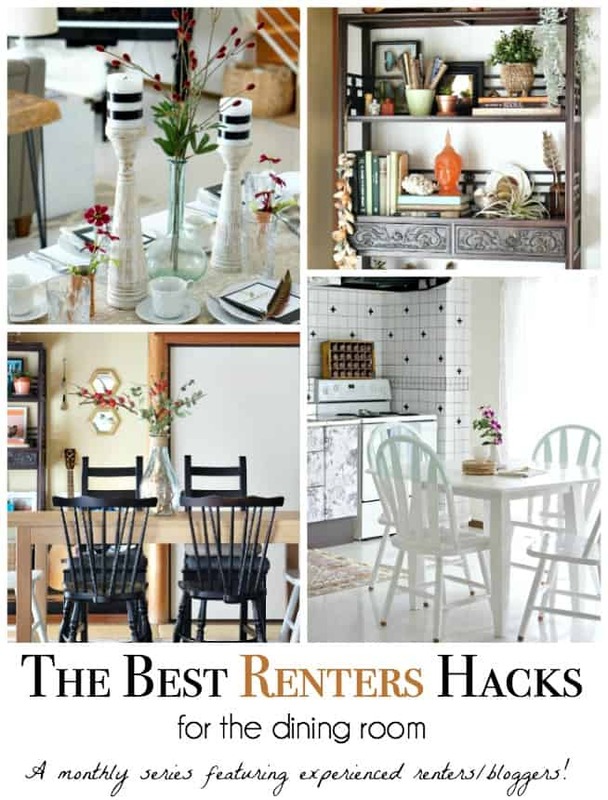 I also read you’re post on 8 tips to decorate for renters. I’m incredibly inspired. Oooh, that’s a pretty one! Thanks for the love! Love these! Do you know where the sheer, white curtains in the first knotted curtain image (next to the dresser/bust) are from?? They are EXACTLY what I’ve been keeping my eye out for! Thanks Amelia! I bought those curtains at Target. I’m not sure if they still carry them. They were either Threshold or nate Berkus brand. I agree that good looking fabric is an effective way to cover ugly blinds. After all, if you’re renting, it’s not like you can just trash the blinds. The landlord, of course, would have no qualms with you covering them up with fabric. One of the easiest ways to create a home in a rental! !